BOOK NEWS! We got BOOK NEWS! In addition to the piece you see here, we’ve got info on some other new collections DC is putting out. Click here for Super Friends: Saturday Morning Comics Vol. 1, featuring the ultra-rare Aquateers Meet the Super Friends. Click here for All-Star Comics: Only Legends Live Forever, collecting the classic Justice Society tales from All-Star and Adventure Comics — including the Death of Batman — by Paul Levitz, Gerry Conway, Joe Staton, et al. Click here for Legends of the Dark Knight: Steve Englehart, which finally brings his classic run with Marshall Rogers back into print. Damon Lindelof’s Watchmen series is expected to debut on HBO later this year and, somewhat surprisingly, DC is marking the occasion by reprinting stories starring the Charlton Comics heroes who inspired Alan Moore and Dave Gibbons’ magnum opus. 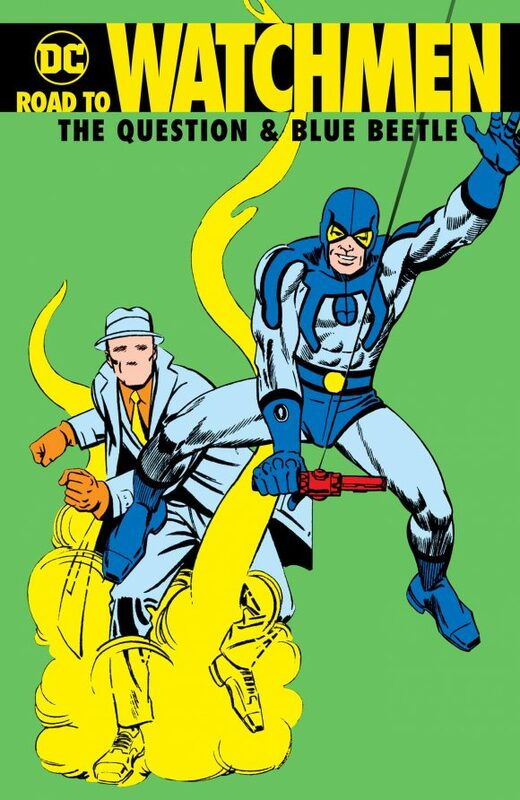 Set for fall release, according to an Amazon listing, is Road to Watchmen: The Question & Blue Beetle, featuring Silver and Bronze Age stories by the characters’ creator, Steve Ditko, as well as top pros like Alex Toth, Gary Friedrich, Steve Skeates, Roger Stern and Michael Uslan. With a new HBO Watchmen series coming soon, DC collects some of the best stories starring the heroes that inspired the cast of the original WATCHMEN comic series. At the height of comics’ 1960s Silver Age, artist Steve Ditko was winning praise for his spectacular work on Marvel’s Amazing Spider-Man and Doctor Strange. At the same time, Ditko was also creating powerful tales of other heroes: Charlton Comics’ Blue Beetle, Captain Atom and the Question. Now, for the first time, DC collects stories starring these enigmatic heroes, plus the Peacemaker and others — the heroes that provided the inspiration for WATCHMEN team members Nite Owl, Doctor Manhattan, Rorschach, the Comedian and more. 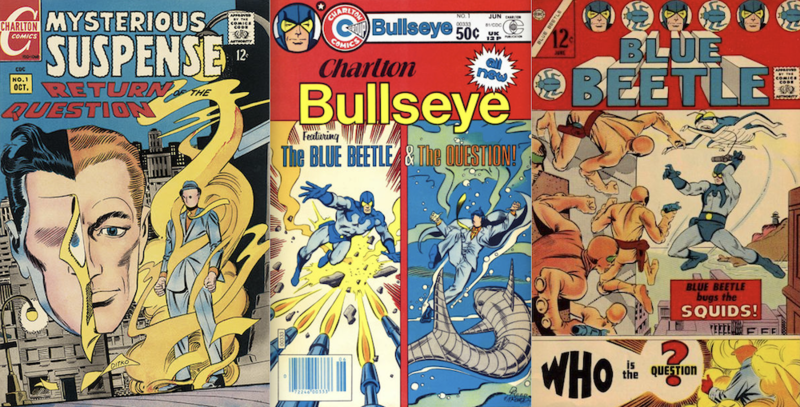 Collecting stories from CAPTAIN ATOM (1966) #83-86, BLUE BEETLE (1967) #1-6, MYSTERIOUS SUSPENSE #1, CHARLTON PREMIERE #3, THE CHARLTON BULLSEYE(1975) #1, #5, THE CHARLTON BULLSEYE (1981) #1, AMERICOMICS #3 and AMERICOMICS SPECIAL #1. Ditko on the left. Dan Reed and Bob McLeod in the center. Ditko on the right. 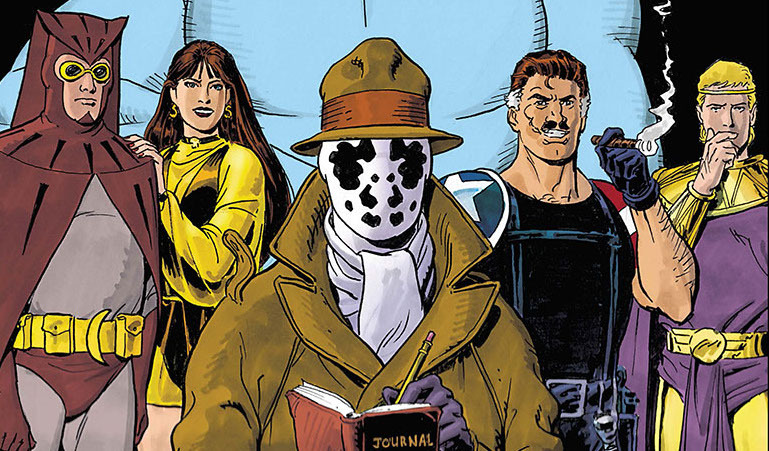 — The Amazon listing also calls the book Road to Watchmen: Rorschach and Nite Owl, so it’s not clear what the final title will be. — Requisite caveat: DC hasn’t officially solicited this book yet. Sometimes their collections show up on Amazon and in other listings before that happens. Not only that, DC has had a frustrating track record lately with its retro collections – soliciting books and then cancelling them shortly thereafter. So, it’s a matter of waiting until this actually comes to pass. — All that said, this is a pretty groovy collection. Some of these stories popped up in DC’s The Action Heroes Archive Editions about 15 years ago but others have never been reprinted, at least as far as I can tell. Neato. This is really generous of DC.